The Chagos Archipelago is claimed by the United Kingdom as a British Indian Ocean Territory. It lies about 1,770 kilometers east of Mahe which is the main island of the Seychelles. This island group is located in the central Indian Ocean. It is located about 500 kilometers south of the Maldives. All access to the territory is controlled by the United Kingdom. A permit is mandatory and it is only issued to yachts for safe passage and no commercial flights are allowed. There are approximately 60 low-lying coral islands that cover around 640,000 square kilometers of ocean. The Chagos Archipelago consists of different coralline rock structures over a submarine ridge. This submarine ridge runs southwards across the center of the Indian Ocean. It is formed by volcanoes above the Reunion hotspot. This archipelago also contains the Great Chagos Bank which is the world’s largest coral atoll. The ecosystem of Chagos Archipelago is resilient to climate change and environmental disruptions. It has a tropical oceanic climate which is hot and humid but moderated by trade winds. This archipelago and its surrounding waters is one of the most diverse places on earth. It is also home to the world’s largest terrestrial arthropod which is Coconut Crab or Birgus Latro. The native flora of this island group was originally thought to comprise of 41 species of flowering plants and 4 ferns. Declan, Tobin. " Fun Facts for Kids about Chagos Archipelago ." Easy Science for Kids, Apr 2019. Web. 24 Apr 2019. 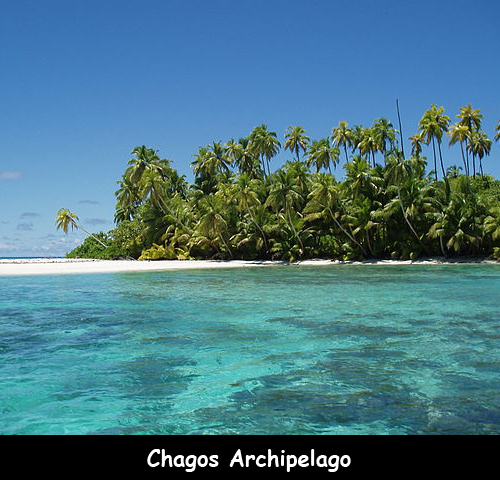 < https://easyscienceforkids.com/chagos-archipelago/ >.